Ten Stones is an intentional community designed, organized, and developed by its 17 member-families. It embraces 85 acres of woodland, meadow, and agricultural land and 16 clustered, privately owned, half-acre home sites. We have no common creed other than a desire to live cooperatively, ecologically, and economically. Our community features a constructed wetland for wastewater treatment, five straw-bale homes, an organic subscription garden (CSA), and a chicken co-op. Our common house is the focal point of many community activities, such as shared meals, yoga classes, meditations, craft making, community meetings, movie nights, public lectures, and various celebratory activities. 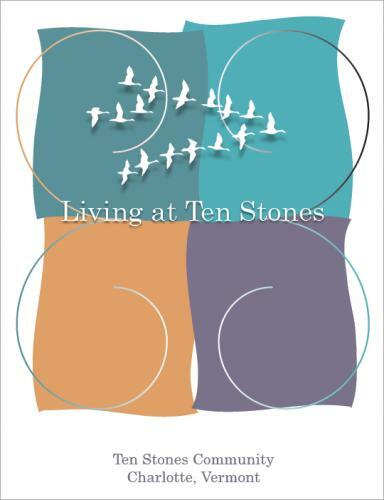 The families of Ten Stones enjoy sharing resources, caring for each other's children, and designing rituals to mark important events in our lives. Our community also enjoys assisting others—individuals, study groups, and other intentional communities—in learning to build community for themselves. There are currently no homes for sale in Ten Stones.